A friend had some time off work and was willing to go on a winter journey into Olympic National Park. He has been day hiking with me now for 3 year, but has never done an overnight type trip. It was time for him to step into the world of backpacking, even tho the conditions weren't what a beginner should really experience. Temperatures ranged from 19 to 32 degrees through the trip. Tho it was winter, could not pass up the chance to be in the alpine, the cold weather also made for pristine air quality. This means no haze in the air for photography! The loop hike starts at the Whiskey Bend Trailhead in the Elwha valley. You walk on the Elwha Trail just past Elkhorn Camp, before fording (crossing with no bridge) the Elwha River, then climb up to the Dodger Point Lookout at 5,800' elevation. From there a hiker uses the Long Ridge Trail back down to the Elwha Valley, crosses the Dodger Point Cable Bridge (Elwha), passes Humes Ranch, before completing the loop back to the Elwha Trail once again. Want to learn more? 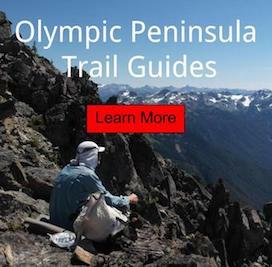 Check out the complete guides to the Olympic Mountains! This loop hike would lead us into the Elwha valley and then to its upper drainages. It was the perfect combination of forest walking and alpine views. The trek is not for the novice, because of all the elevation one must gain and the river ford; which must be timed in perfect conditions. This was my first overnight camping trip for the new year. I was on a mission to get back to Dodger Point, after the last trip the weather was poor, and had us pretty much socked-in the whole time. Olympic Mountains have a super low snowpack this year. Happy to still be able and take advantage of that fact. Could this mean early alpine season? Found this at the opposite bank of Remann Cabin, hiding behind some alder. Similar, but smaller flagging marked the way through the questionable sections of primitive trail. There is also no water from the bottom, till around 4,000' and that maybe seasonal. Few hours past and into the snow now. Getting a first look at Mount Pulitzer. Looks a lot different than when we were there a few months ago. Looking W, Bailey Range and Mount Olympus. I really enjoyed this loop, plan on doing it again in the autumn months. This is a super rare trip to be done in winter, because of low snow pack and cold temperatures. It was done without the aid of snow travel equipment, in fact, both parties wore only Vibram FF and socks to protect ankles from the ice; while post-holing. 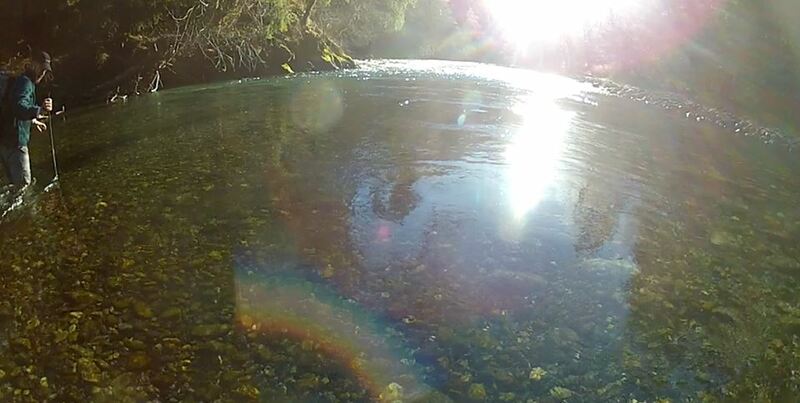 The Elwha River ford can only be done with the temperatures are cold enough for the level and volume to be low. You wouldn't want to try this in late autumn through late summer or the water could be high enough to make a ford impossible.